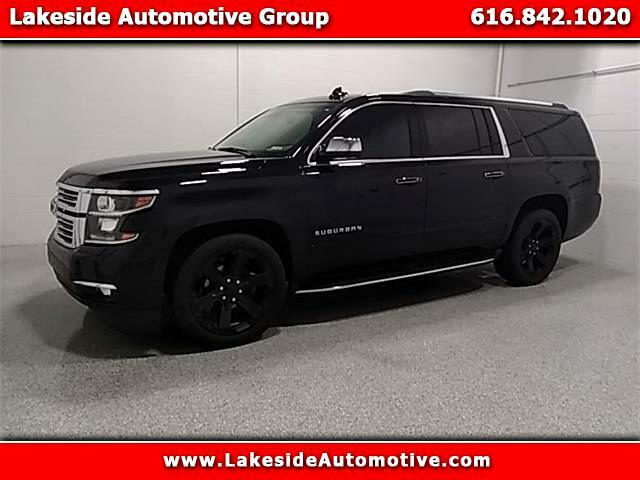 2015 Chevrolet Suburban LTZ Black CARFAX One-Owner. ***4X4***, ***SUNROOF***, ***LEATHER***, ***GPS NAVIGATON***, ***BACKUP CAMERA***, ***BLUETOOTH/HANDS-FREE***, ***HEATED SEATS***, ***TOWING PACKAGE***, ***3RD ROW SEATS***, ***LUXURY PACKAGE***, ***APPEARANCE PACKAGE***, ABS brakes, Alloy wheels, Compass, Electronic Stability Control, Fog Lamps, Front dual zone A/C, Heated & Cooled Driver & Front Passenger Seats, Heated 2nd Row Seats, Heated door mirrors, Heated front seats, Heated rear seats, Illuminated entry, Low tire pressure warning, Power Folding & Adjustable Heated Outside Mirrors, Power Liftgate, Power-Adjustable Accelerator & Brake Pedals, Remote keyless entry, Traction control. * 2015 KBB.com Best Resale Value Awards Lakeside Automotive Group is located at 14953 Cleveland St. Spring Lake, MI. Under new ownership since October 2015, we are honored to be able to build upon the great reputation that has been established at Lakeside since 1966. Our staff has a strong commitment to each and every one of our customers and the community in which we serve. One visit and you’ll experience how we’re driven by value and witness our desire to be the preferred pre-owned vehicle dealership in West Michigan for years to come.